MCR-L (SCAR - Special Operations Forces Combat Assault Rifle) is a Belgian made modular rifle made for USSOCOM to satisfy the requirment of the SCAR Competition. This family of rifles consist of 2 majoy type: SCAR-L (Light) which is chambered in the 5.56x45mm caliber and SCAR-H (Heavy), which is chambered in the 7.62x51mm caliber. Both are available in Long Barrel (LB), Standard (STD) and CQC (Close Quarters Combat) Variants. MK16 was designed to use by US Army in order to replace M4A1 Carbine, but MK16 was cancelled because the performance was nearly the same as other 5.56 rifle so hard to justify the purchase. Although it cannot replaced the M4 Carbine in US Army, SCAR L was used by serval forces like Belgian Police, Special Force, German GSG9 and Kenyan Special Force. Also, SCAR 16S, which is the semi-auto version for law enforcement and civilian market, was released in 2008 same as SCAR 17S. WE SCAR AEG Series comes with the same function already on their M4 AEG: When user turns to “Safe”, it will release the spring in the gear box back to normal state. 14mm Counter Clockwise Steel made Flash Hider. Comes with a standard type barrel in 14mm CCW and can be removed for install silencer. Comes with a folding front sight with gas block. Gas block adjuster is a build-in hex key which can remove from the gas block for maintenance used. Comes with CNC Aluminium upper frame with MK16 / MK17 Laser Marking, a 20 mm top rail, 2 side rail, 1 lower rail for rail attachment and a rail-mounted scar type rear folding sight. Comes with a full-length dummy bolt carrier and the Bolt Lever can be switch to right size. Comes with a Nylon Fiber Gen 4 Lower Frame with ambi magazine catch and selector. Constructed of WE Ver 2 8mm metal bearing Gear box. Realistic SCAR type trigger is included. Comes with Nylon Fibre 6-position retractable stock which can folded and with a 2-position cheek rest. 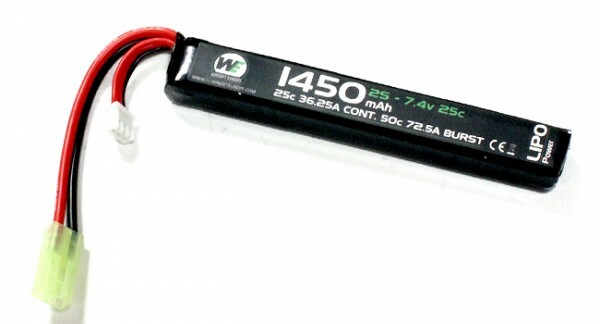 Rear stock can store up to 9.6V small type Battery / 7.4V Lipo (small plug). Compatible with most of the TM M4 style magazines in the market. Gear Box: WE Custom Ver 2 8mm Metal Bushing Gear Box.